Sensory roughness is one of the most important factors that determines the quality and/or value of various wood products. 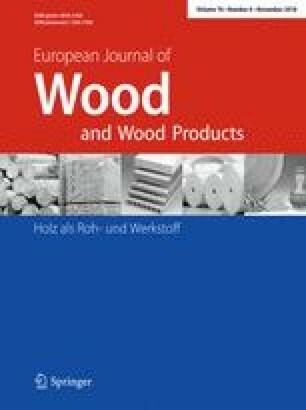 The aim of the present study was to confirm whether the sensory roughness of coated wood surfaces could be estimated by the here proposed image analysis. Twelve white oak (Quercus alba) fancy veneer overlaid plywood samples were prepared with two types of grains and six coating specifications. Forty participants subjectively evaluated the sensory roughness of the samples by rubbing their surfaces without being able to see them. Sample surface images were acquired with a goniophotometric method and were submitted to an image analysis to calculate lightness differences (contrast) between relatively small areas as image characteristics. Three surface profile parameters were also measured based on the conventional stylus method. Three-way analyses of variance for the evaluation of sensory roughness revealed significant main effects of the coating specification and the rubbing direction. Although contrast and surface profile parameters were hard to estimate in terms of sensory roughness for spiny surfaces, both measures were well correlated to sensory roughness for porous surfaces. In particular, the linearity between the sensory roughness of the porous surfaces and contrast was equal to or greater than that of the surface profile parameters.